WASHINGTON – Arizona officials were extending their condolences for a Tucson native who was among three soldiers killed Friday when their “convoy came under fire entering a Jordanian military base,” according to a Defense Department statement. Staff Sgt. Kevin McEnroe, 30, of Tucson, had more than eight years of service and was on his third overseas tour when he was killed while serving with the Army’s Special Forces Group, or the Green Berets, the Army said in a statement. McEnroe died of injuries sustained from small-arms fire outside a military base in Jafr, Jordan, along with Staff Sgt. 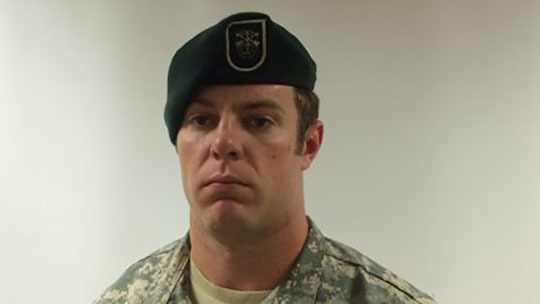 Matthew Lewellen, 27, of Lawrence, Kansas, and Staff Sgt. James Moriarty, 27, of Kerrville, Texas. Few details were available on the incident, which the Pentagon said is still under investigation. Gov. Doug Ducey ordered flags flown at half-staff Monday “to honor the bravery and service of Staff Sgt. Kevin McEnroe, who died in Jordan this weekend,” the governor said in a tweet early Monday. Other lawmakers followed suit, praising the soldiers who were “tragically killed while supporting critical counter-terrorism operations in the Middle East,” in the words of Sen. John McCain, R-Arizona. “These brave men will be remembered for their selfless sacrifice and dedication to the freedom and security of a grateful nation,” McCain said in a statement from his office. Rep. Martha McSally, R-Tucson, said in a statement released Sunday that her heart went out to McEnroe’s loved ones. McEnroe was 5th Special Forces Group, Airborne, based at Fort Campbell, Kentucky. Calls Monday to the base and to his unit were not immediately returned. McEnroe’s awards included the Army Commendation Medal, Army Achievement Medal, Good Conduct Medal, National Defense Service Medal and the Afghanistan Campaign Medal, according to the Army. He was also awarded the Global War on Terrorism Expeditionary Medal, the Global War on Terrorism Service Medal, NCO Professional Development Ribbon (numeral 2) and Army Service Ribbon.